This is one the top Bootstrap 4 template in 2017. Download this best free coming soon Bootstrap 4 template and launch your website in a minute. 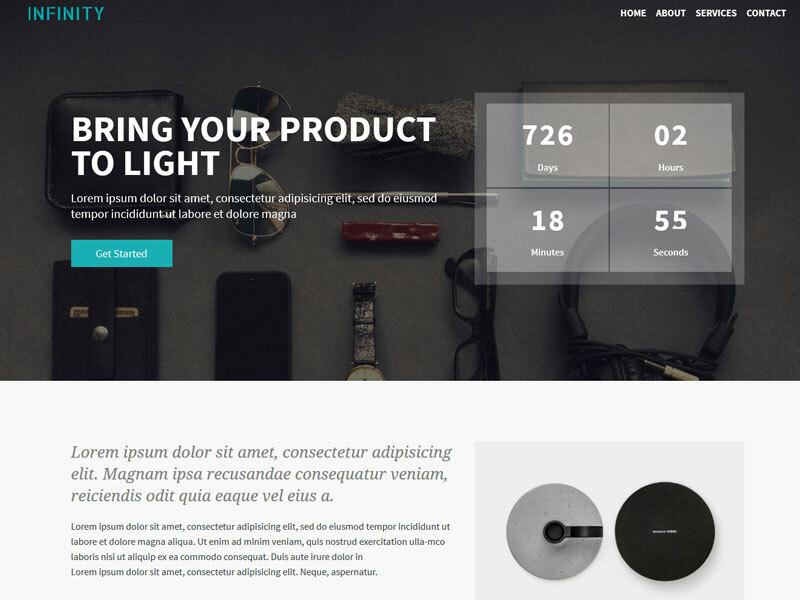 Infinity is a coming soon responsive, clean and free HTML template. The developer designed it using Bootstrap 4. This single page template is prepared with countdown timer, about and service section and with a contact form. Infinity will help you to expose yourself. Infinity is one of the best free coming soon Bootstrap 4 template to download in 2017. Best Free coming soon Bootstrap 4 template with Pretty-looking Visuality. Modernizr supports to implement the latest html5 and css3 features in the older browser. It holds the test to the client who visits your site from the earlier browser. Modernizr provides an easy way to detect any new feature so that you can take the corresponding action. For example, if a browser does not support video feature then you would like to display a simple page. Jquery form, countdown, nav, sticky and validation plugin bring a UX-based website to you. Clients or visitors navigate the site from any section for the jquery sticky navbar. The jQuery Form Plugin allows you to quickly and inconspicuous upgrade HTML forms to use AJAX. Infinity, the free coming soon Bootstrap 4 template holds W3C validated codes. The developer commented each section carefully. So, this reduces your pressure to find and replace your content. As for well-commented coding, you will be able to customize its every section without any hassles. After all, within a short time, you will be exposed yourself to your clients. By the way, Want updates about our new templates? Just subscribe to our email newsletter. Don’t be tensed, and we will never spam you. Technology Used: HTML5, CSS3, Bootstrap4, Theme-fisher Font, Font-Awesome, jQuery. Please Note: The developer uses some images in the final download files for demonstration purpose only. Please, replace these by your related images. ThemeWagon is a source of free responsive HTML5 Bootstrap templates. Along with this best free coming soon Bootstrap 4 template, it has a listing of 150+ free templates. Download any of them. Moreover, all of these fulfill you and your client’s need.